The local paper today had a photo of a Cub Scout placing flags at the local National Cemetery. My daughter texted to say they’d just driven by the National Cemetery on Long Island and seen all the flags by each marker there, mentioning how impressive it was. I’ve seen Arlington National with thousands of flags fluttering boldly next to thousands of small white markers marching into the distance. It occurred to me to ponder on the enormous number of flags placed by faithful hands all over the United States. A mind boggling number. 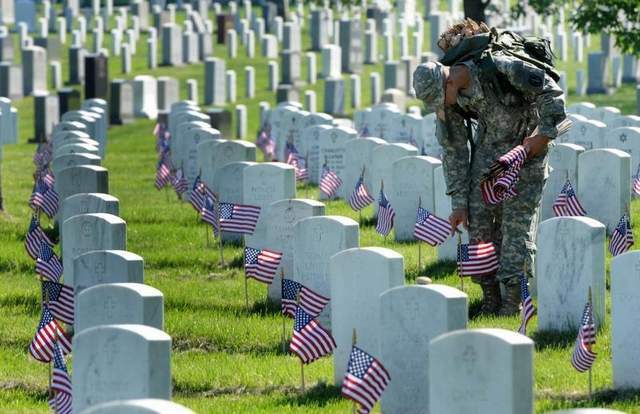 Then, of course, was the sobering reality that each of those flags represents a young man or woman who sacrificed everything they had to preserve this country and all it stands for. From that chilly day in April, 1775 in Lexington and Concord, Massachusetts to this, through two world wars, Vietnam and Korea and now the Middle East, on land, at sea, and in the air. When I was seventeen, I was a majorette and marched with the high school band. One of the most memorable of those times was one unusually hot Memorial Day – Hot at least, by New England standards. It was so hot that several members of the band fainted during the two-mile march from the town center to the cemetery and had to be carried off to recover. Once we got to the cemetery, we sat in a small patch of shade while the various dignitaries droned on. I have to confess, I don’t recall a single word any of them said. I was more intent on the welcome sight of my father hoofing it over the hill with a jug of ice water my mother had insisted he bring to us. The idea of gallant young soldiers, slain in the prime of their lives for a cause far larger than themselves seemed poignant, yet removed from me and my life. My viewpoint today is far different. 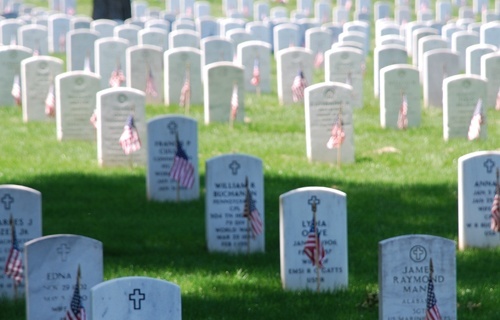 I’ve spent my share of three-day-weekends playing at the beach and enjoying parades and cookouts, but I’ve also come to a place in my life, where I take the time to reflect on what Memorial Day is really all about. Instead of watching a parade with the simple enjoyment of hearing the bands play and watching the uniformed representatives of the various military branches march past, I see the ghosts of those who never made it home to march in a parade. I’ve always flown my flag, but now, when I run it to the top of the pole and then lower it to half mast, I am remembering in my heart all those who have given all they had to preserve my freedom to fly it at all. God bless each and every one of you and thank you for all you have given for me.